Saturday, March 22, 1913: Didn’t do so very much today. In 1913 Easter was on March 23, so this was the day before Easter. Did the Muffly’s make Chocolate-Covered Coconut Eggs? 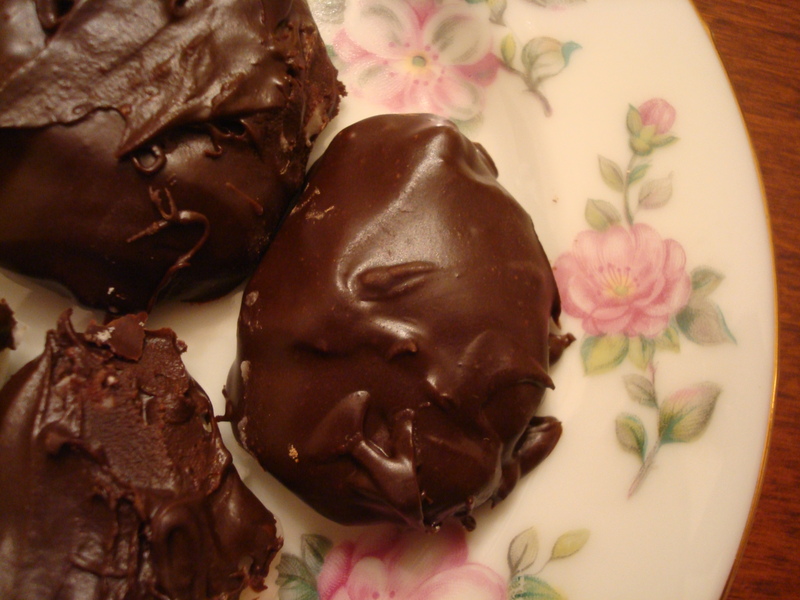 It was an Easter tradition when I was a child to make Chocolate-Covered Coconut Eggs. We’d start with a coconut and first tap holes with a nail and drain the coconut milk—and then break the coconut apart and get the meat out. 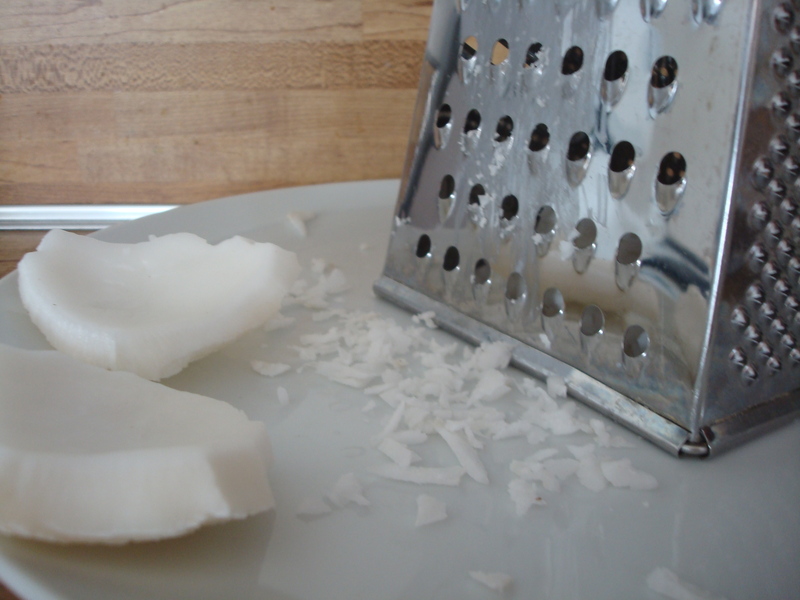 We used an old metal grinder to grate the coconut. The freshly grated coconut and coconut milk gives the candy a wonderfully fresh taste. Combine all ingredients except chocolate. Add just enough coconut milk to make a soft dough; shape into small eggs and place on cookie sheets or plates that have been covered with waxed paper. Let dry overnight. Coat with melted chocolate. Store in refrigerator. Makes approximately 50 pieces of candy. Posted on March 22, 2013 August 30, 2015 by SherylPosted in Food, recipesTagged candy. This sounds so delicious! I bet it makes a huge difference to use fresh coconut, vs. the dried out stuff I buy in bags. Do you think they had access to whole coconuts in the Northeast in those days? Oh, yummy. Maybe Grandma was still tired from all her partying! Yummy – I’m so tempted to try and make these I printed out the recipe! sounds wonderful.. We made home made coconut (fresh) crumbles last Christmas. Taste so much better than store bought coconut. We will have to try this recipe. Wow, I’ve never even bought a coconut only the bagged kind. Would they have found a real coconut in their grocery back then? The railroads were bringing a broad range of foods to rural Pennsylvania by the early 1900s. I think that coconuts–as well as oranges and grapefruits–were available. They might have been relatively more expensive than they are now. A lovely recipe, but I know how hard it is to crack open a coconut and retrieve the meat. Grew up in Florida and watched my Dad do it. Tis not an easy task, but the milk and the meat are delicious. What a wonderful recipe…that I should try! There is nothing quite like the smell and taste of fresh coconut! My Dad used to bring coconuts home, break them open and we drank the milk and ate the meat…never have used it in a recipe. This looks so tasty and pretty! Amazing recipe. I can’t even believe you shared it! Yum . . . . I looove coconut yet have never heard of these…and I live in the tropics. My parents started a fine chocolates candy company when I was in high school and put me to work right away! It’s fun to be a professional chocolate dipper. Thanks for the information. The old recipe used paraffin and I hadn’t realized that there were better options. I can’t think of a better job for a teen than working as a professional chocolate dipper in the family candy business. It sounds awesome! You certainly know how to make my mouth water. You’d like it. It is mouth watering. I will be happy to evaluate anytime. Just send me a box of them. This recipe sounds very tasty! Yummm! My mother, Mae Gerace, was born 1913 in Palo Alto, PA. (outside Pottsville) When she was 16 years old, she went to work in a candy company in Palo Alto. If my memory is correct, the name was Costa Candy. Every Easter my mother made homemade chocolate covered, fresh coconut eggs for all of the children in the family. when I was 5 years old, all of my older cousins were happily waiting for the candy and I said “I do not like them”. My mother never made them again and my cousins never forgave me. I will be 75 tomorrow and decided to search for her recipe. Thank You! My grandchildren will love this. Thanks for sharing the story. I hope that your grandchildren enjoy the candy.